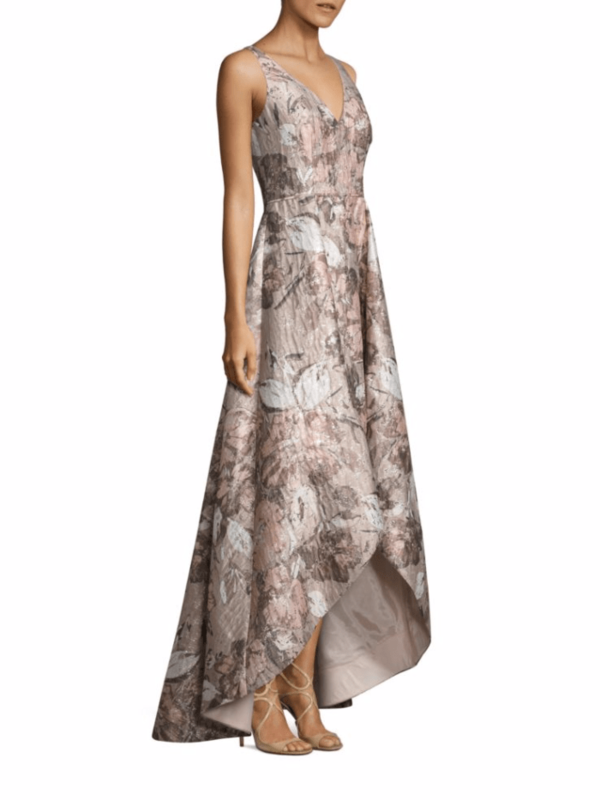 This post about high-low dresses for the Mother-of-the-Bride has shopping links throughout this post that are from our affiliates and sponsors. High-Low dresses for the Mother-of-the-Bride are in for 2017-2018 weddings! The high-low hemline is nothing new, with this cutaway front style being first seen in Victorian times, and coming back into fashion during certain decades of the 20th century. Most of the 2017 versions of the high-low hemlines we’ve been seeing offer a balanced look that offers just a little peek of the ankle and calf, but still keeps the gown at a formal length. 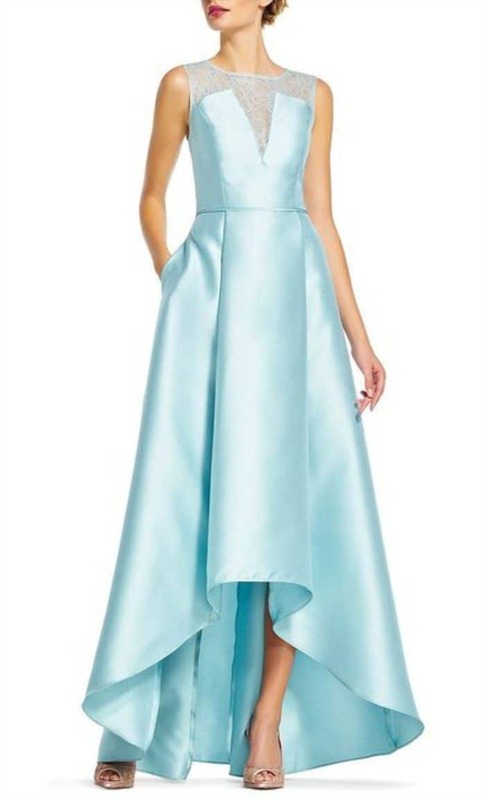 These modern classic silhouettes make for a great choice for fashion-forward mothers seeking a gown for their daughter or son’s wedding, especially when done in a beautiful flowing chiffon fabric or in a silk or taffeta ball gown. 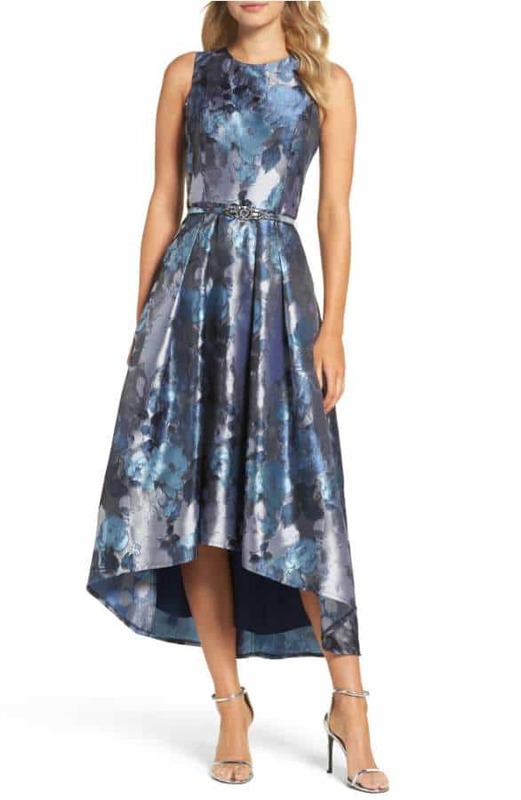 Lately we’ve seen so many high-low styles we love, we’ve decided to dedicate a few points to this look, starting off with these choices for mother-of-the-bride dresses. 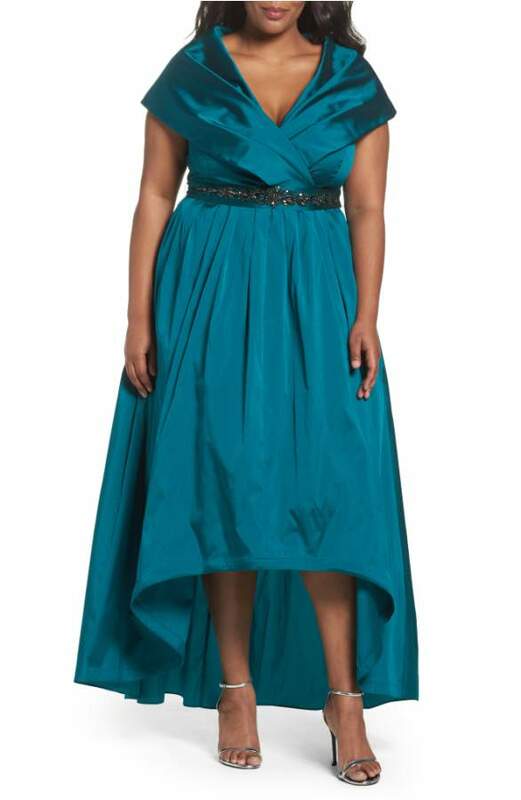 The emerald green style above would be ideal for a fall wedding, but we’ve seen hi-low hems in dresses for all seasons. Here are a few more favorite looks! 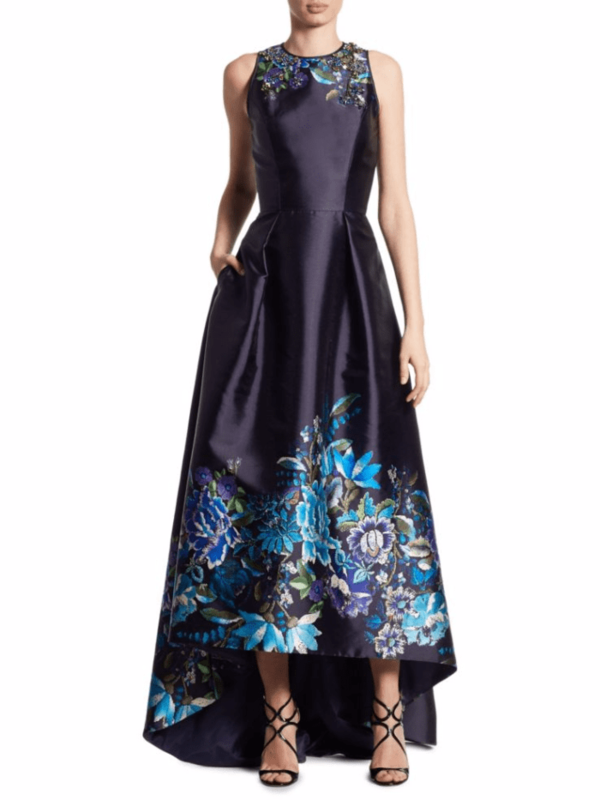 More High-Low Hem Gowns, and Where to Buy Them! 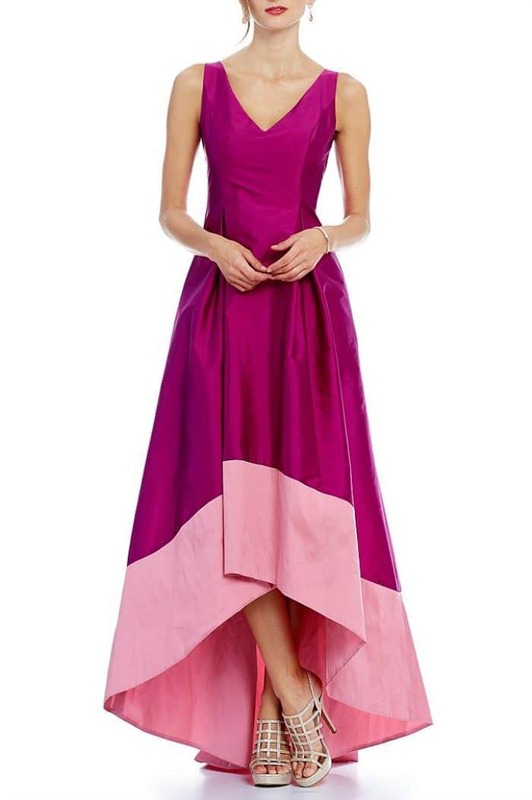 This delicious raspberry-colored colorblock high low hem gown. For a day-to-evening look or just shorter high-low look try this floral print dress. 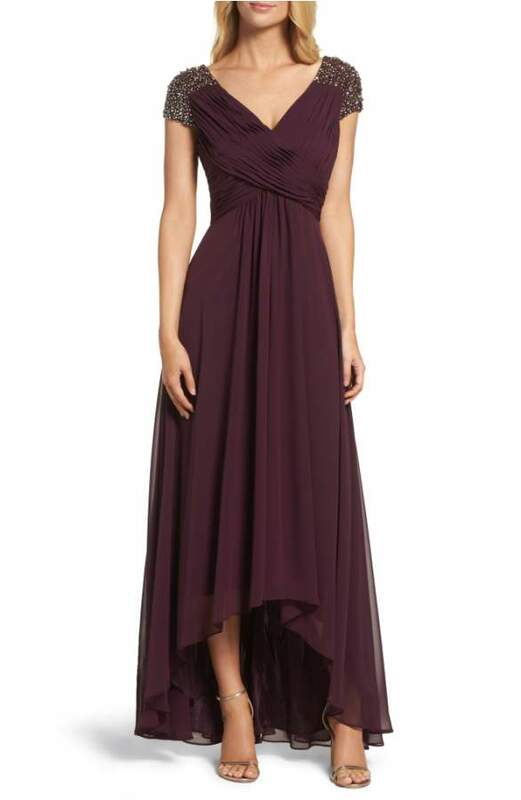 This gown is the same as the dress in our styled look, but just a different plum or burgundy color option. It also comes in silver. 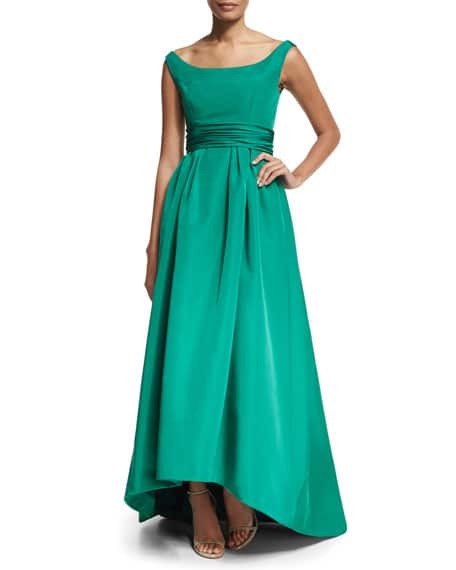 A designer style by Carolina Herrera in a beautiful green. 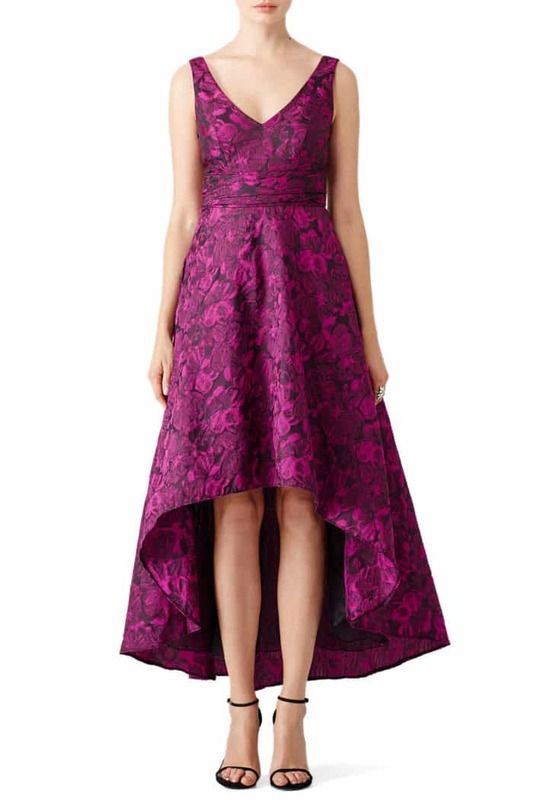 A designer piece – Carolina Herrera Off-the-Shoulder Gown with High Low Hemline from Neiman Marcus. Another stunning emerald green gown with shawl collar. 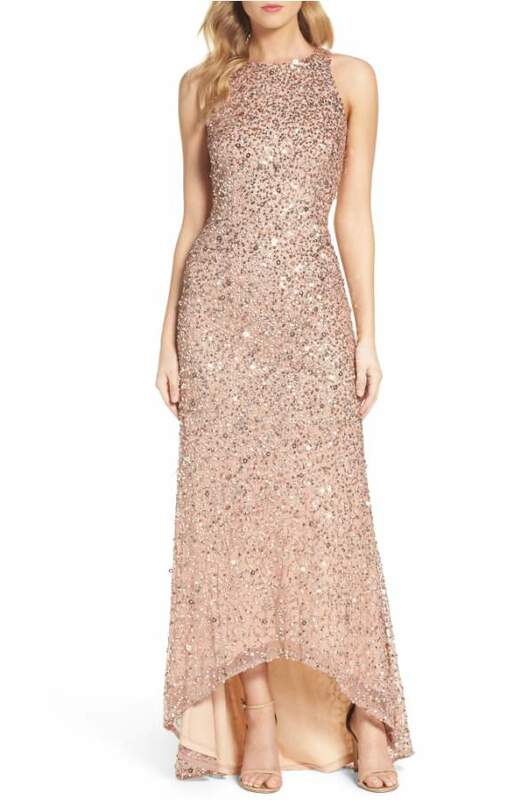 Ideal for a formal fall or winter wedding! 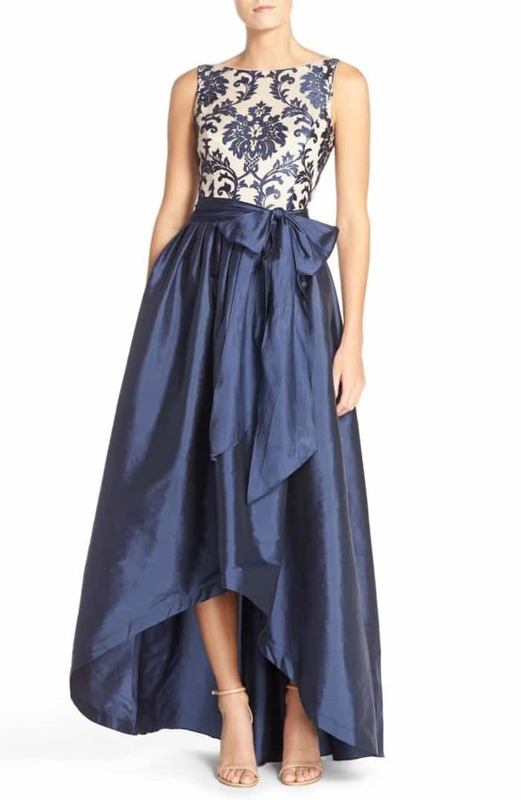 Embellished Portrait Collar Taffeta Gown from Nordstrom – $259.00 Available in Plus and Regular Sizes. 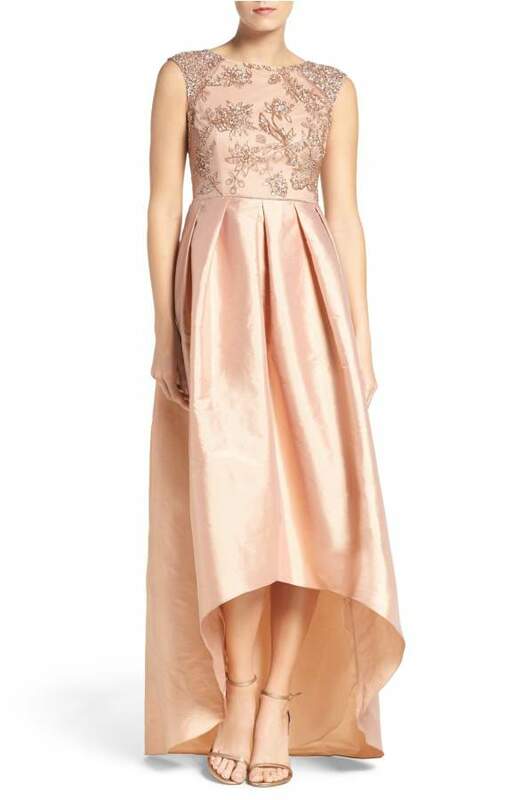 This elegant blush and metallic jacquard is a beautiful neutral choice. 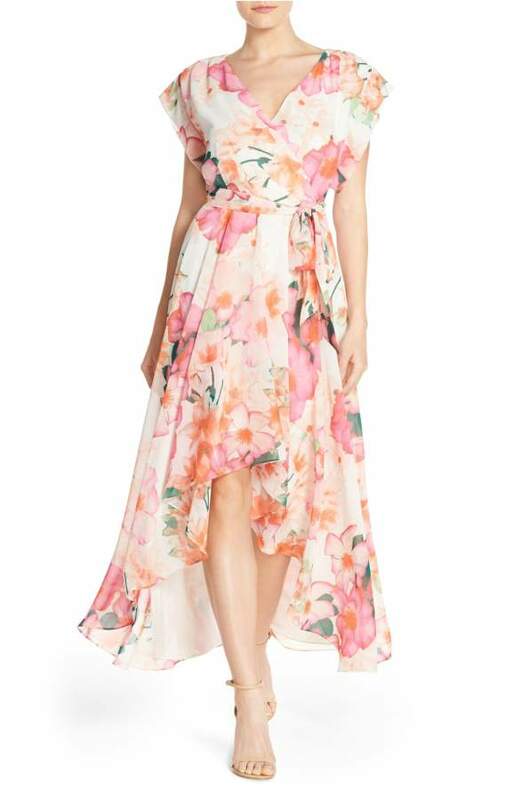 For an informal spring, summer, or garden wedding, a mother-of-the-bride would look lovely in this breezy floral print style. 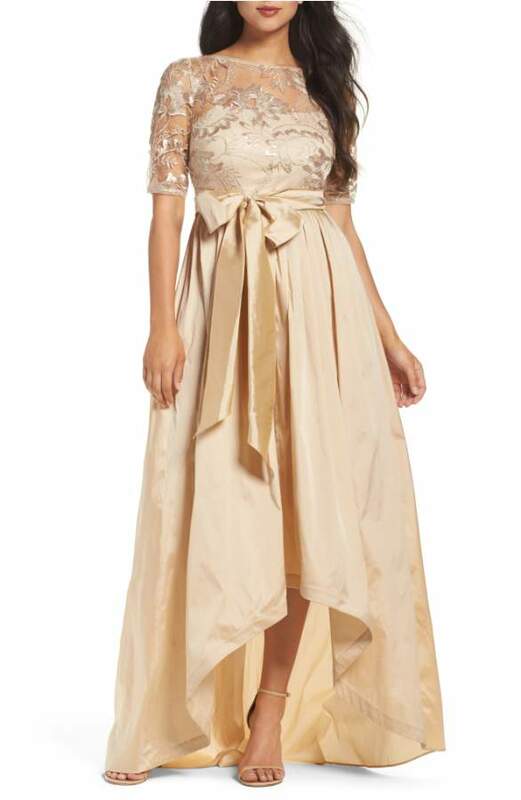 A golden gown with sleeves – a beautiful choice for Mother-of-the-Bride in a black tie wedding. Navy sequins paired with modern racerback style top, make this one sleek evening high-low length gown!